I feel like its maybe been a bit heavy this week on Modern Reject, what with me almost dying followed by the whole discussion on judging other’s sins. You know, nice and lighthearted. I’ve also had a lot of personal junk going on, including ongoing physical pain. Basically, I feel like junk. Oh, and to top off the week, I’ve received some less-than-encouraging emails from a few individuals that inevitably lead to me to question why I write this blog in the first place. But, let’s put all that aside. That’s what I decided to do and in doing so, I spent far too long on various websites reading completely ridiculous, perhaps even inappropriate, but hilarious stuff. 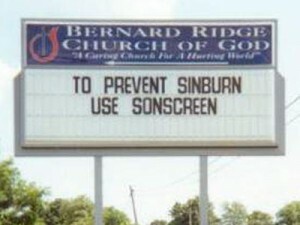 With that in mind, I decided to share a few of the bad church signs I viewed. If you’ve seen any of these before, I apologize. But, hopefully they will just make you chuckle…that’s what I needed anyway. Which was your favorite? I happen to love “whatever,” and did you catch the problem with “Four Letter Words”? Do you have guilty pleasures? Thanks to this site for the photos. 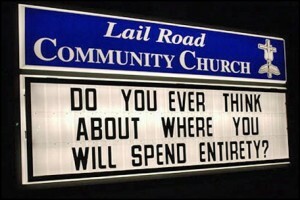 I do so enjoy silly church signs. Sure, they make me roll my eyes and chuckle to myself at times, but so what. Even if they are preaching Christ out of selfish ambition, (and by using silly one-liners to get folks to pad their pews with numbers), all that matters is Christ is being preached. Right? Right. Thanks for making me laugh today! Once again, thank you for spurring me on. Thing is, I’ve been having a really hard time with motivation and the desire to keep this blog going over the last few months. So, when things like this go down, it makes me more susceptible to discouragement and doubt. I certainly don’t expect everyone to love me or agree with me. That would be so boring, but I’m just feeling worn down right now. That one is my fave of all of them! So ambiguous and yet so telling! LOL! 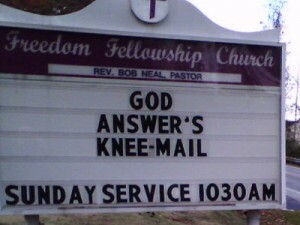 I have always detested church signs that insulted my intelligence. How about just putting scripture on the sign and let God do the rest. I’m entirely too amused by these things. Doesn’t matter if I’ve seen ’em before; they crack me up! They also make me despair over the state of English instruction in this country, as evidenced by the errant apostrophe in marquee #2. But, I have to admit, my favorite is the last one. It cracks me up. I’m guessing some enterprising prankster with a love of anagrams did that…all the letters for eternity are there. Just not in that order anymore…. The ‘come hear our preacher’ one is my favourite! You can’t shake the kingdom without upsetting the mice. Like you, I appreciate the encouragement of others, but I stopped caring about opinions. Write for you, for those who are convicted, for those who like to be challenged and more than anything, for Him. Good advice and I do write for Him. Problem is, people think I’m supposed to write for them. And I’m just extra tired and worn down right now, physically and mentally, so it’s easy to become despondent. Hooray for Catalyst! Can’t wait and yeah, yeah, yeah…crack your “hydration” jokes. I deserve it. “What’s missing from CH_ _ CH? Oh. Stop. My stomach hurts. I really enjoy your posts and usually take something useful, thought provoking and encouraging. Keep going. Resistance means strength and progress. Thank you for the kind words and for the link. I will be checking it out and I happen to love poetry! Ha! 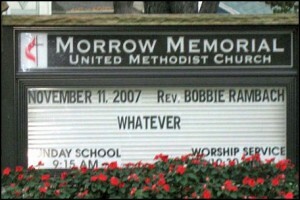 I *died* at the sign that just says “Whatever”! So hilarious. Aside from that, consider this an encouraging email that hopes you continue to write your blog. And then the editor in me cringes because I wrote “apostrope” instead of “apostrophe.” How’s that for “Pride goeth before a fall”? Ha! It’s okay. 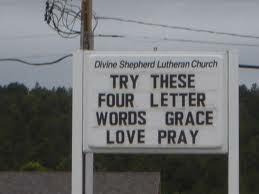 There’s grace for grammar and typos, too. It says: “Don’t let worries kill you, let the church help.” I laugh every time I see it. I’m not sure I get the “whatever” sign, am I being dense? Nicole. I am so sorry that you have received less than encouraging emails the last couple months. You are a gem of a blogger, a modern day prophetess, and a jewel in Christ’s crown. Be encouraged that for every word of hate spoken against you, other people are raining love and grace. And love always wins! As someone who enjoys preaching, the “Know what Hell is? Come hear our preacher” cracked my ribs in a major way. You blessed me tremendously, John. Thank you. The sad thing to me is what we laugh at the culture drives by and mocks. On our sign we passionately try to avoid religious clichés that really only speak to the religious or condemn the distant. 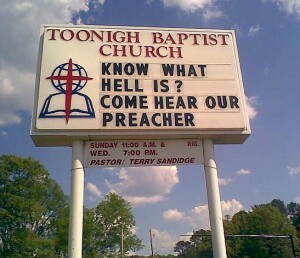 When attitude shows up on the sign just imagine the attitude in the pew… or pulpit. I had someone send me a note to complain that we don’t use our sign for Bible verses or evangelism – signs don’t witness, people do. 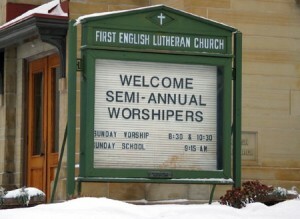 Signs just reveal the personality of a church. By the way – thanks for your blog. Keep helping us think. I can relate since I also love that word. It’s wonderful that God shows us grace by overlooking our sins, and when we can follow His example by overlooking other people’s faults. The only problem is that sometimes we press matters by mistakenly expecting other people to disregard our obvious failures, as in the case of the person who put up this sign. Since you needed encouragement and motivation to continue this blog, I tweeted this to my followers. I’m not sure how long you’ve been doing this, but you already have many followers and I think there’s a lot of potential. There’s a good mix of personality, personal experience, and theology here. Cute signs. I used to wonder why we need the extra maketing to reach people and then I understood. We are not all the same or think or act the same, so different approaches appeal to different needs and makeups. Your blogs are open, honest and thought provoking. Don’t stop. Thanks and God bless and renew you. I didn’t notice any problems with the ‘4 letter words’ sign. Maybe its becuze I gradeated from the L.A. City publik sckool sistim. hangers for young children, youth, and older people. Even so, even down bearing this mark can be unsuitable pertaining to rug hooking worsted as nicely as wool materials fulfill the standards to use the software. jackets you are shopping for. The only difficulty is that ties are frequently delicate, which will make them complicated to shop in crowded closets. and purses have been escalating by just about every passing day. Previous Previous post: Should Christians Judge Others?